Thinking about how to share your interviews? Want to include audio in your exhibition? Hearing people’s voices adds another dimension to any display or production. It’s simple to do and highly effective. I have been producing and editing audio since joining the BBC as a radio reporter in the early 90s. In 1999 I recorded and produced 16 oral history documentaries called ‘The Century Speaks’ for BBC Radio (now preserved in the Millennium Memory Bank at the British Library). There are many ways of presenting audio extracts to an audience – on websites, audio posts or ‘maps’ such as the one opposite, portable audio devices or downloads to smart phones. 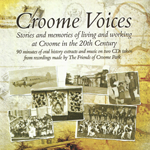 Some of my recent work has included audio exhibits at Wolverhampton Art Gallery and the New Art Gallery Walsall, a canal trail in the Cotswolds, an audio tour at the Worcestershire County Museum and audio posts for the Almonry at Evesham, Droitwich Library and Arnos Vale Cemetery in Bristol. An example of an audio map. This enables you to have photo, text and audio buttons on a panel which can be erected in or outdoors. 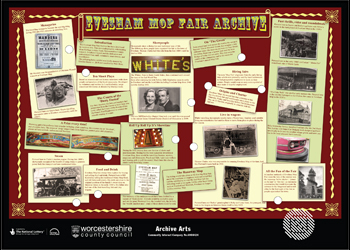 This one was made by Audio Posts Ltd for the Evesham Mop Fair project. It has 12 buttons with themed extracts from oral history interviews. Photo courtesy of Audio Posts Ltd. Hearing people say things in their own way, with their accent, emphasis, pace and emotion, is entirely different to reading a transcript. For me, this is an essential part of any oral history project. Whilst it’s important to keep a master copy of the entire interview just as you recorded it, you will probably want to edit extracts from it to share with your audience. There’s a great deal of skill in selecting extracts, editing them to produce compelling material without changing the sense of what is being said, judging what to leave in and what to take out, and finding a way to keep the essence of a story in just a couple of minutes of audio. People running oral history projects often think that editing is a job for people with good technical skills. Personally I think it’s a job for people with good judgement (they can learn the technical skills). I can either train you to edit your interviews yourself or I can edit them for you. 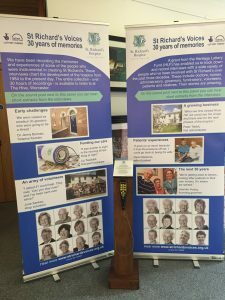 An example of a simple mobile exhibition with audio extracts from oral history interviews – St Richard’s Voices. The audio is accessed from a handset attached to a wooden post between two pull-up exhibition panels. The post is sturdy but easily portable and the handset runs off batteries so can be cited anywhere. Amongst other venues, this display was put up in a busy foyer, a day care centre, and at a national conference. “Julia’s interviewing and editing skills are so developed that she is able to produce beautifully precise life stories and engaging highlights for all who listen”. I think that creating a CD of your material is a great way to share it with participants and the public. It can be a very simple CD with extracts from your interviews, or a more complex affair with commentary, sound effects and music. Below are a few examples of CDs and oral history DVDs that I’ve created recently. If you want to discuss the creation of a CD, or if you are interested in getting hold of a copy of any of the CDs/DVDs below, then please get in touch. 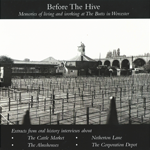 Memories of living and working at the Butts in Worcester. 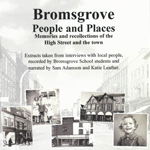 Extracts from Oral History Interviews by Worcestershire School Children. 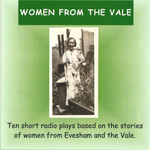 A DVD of oral history interviews with Worcestershire veterans talking about their memories of WW2, made with Splash TV.